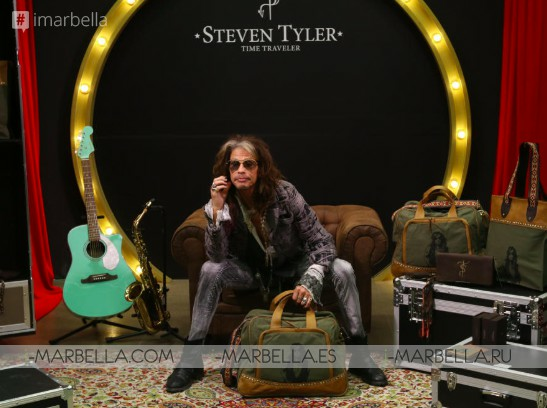 The iconic rock legend Steven Tyler presented his own new brand "Steven Tyler Time Traveller" at El Corte Ingles located in Puerto Banus, Marbella Spain on the 1st of August 2018 for Starlite. He brings together versatile collections of bags and travel to share his passion for travelling and enjoying the time, a way of living eternally. Discover it now! Starlite Shop, an online sales platform that hosts the brands of a large number of international celebrities. After announcing the launch of brands such as Antonio Banderas, Naomi Campbell, Alejandro Sanz and Valeria Mazza, the legendary rock legend Steven Tyler arrives at Starlite Shop. The brand new 'Steven Tyler Time Traveller' is made up of three different collections of bags and travel items. The artist has been inspired by everything that has been lucky to live. For Steven Tyler, life is a journey in time and he is an eternal traveller; "You do not get older, you just grow up." His brand is born from his belief that things tell stories and transmit experiences, and his goal is that his collections are timeless because they will have more and more life; "My creations are like me, a journey through a world of emotions." 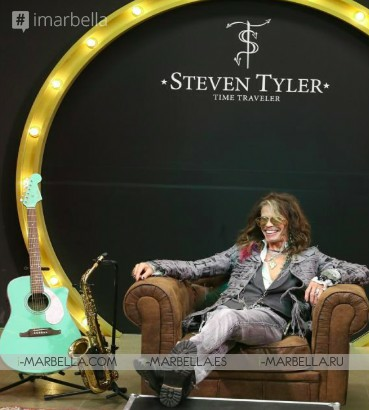 Steven Tyler Time Traveler brings together versatile collections in which he wants to share his passion for travelling and enjoying the time. Their collections want to endure in time beyond fashion, they are a way of living eternally. Steven Tyler Time Traveler can be found at Starliteshop.com and its own e-commerce stores in Mexico, Colombia, and Chile. You can also buy your products at Amazon, eBay and the Starlite Shop at the Moda Shopping Center, the Starlite Festival, and Vialia or the Starlite Shop at ECI Madrid, Málaga, Mijas, and Marbella. In addition to the new collection, Steven Tyler and the best Rock of all times come to Starlite today August 2. Steven Tyler will perform at the Starlite Festival 2018. So be ready for Steven Tyler's overpowering personality, vibrant energy and unmistakable voice, his trademarks with the Band who has sold over 150 million copies, won 4 Grammies, 4 Billboards and 1 Emmy amongst other prestigious awards. Today with a solo project, and accompanied by The Loving Mary Band, Steven Tyler returns with the sound of Nashville, the most authentic Rock that has captivated both his critics and his fans. At Starlite, we will enjoy his presence on the stage with his powerful voice, sharing with us his own songs and his great classics that have turned Aerosmith into a Rock icon. An emotional rollercoaster show that cannot be missed! Starlite Shop is the meeting and creation point for International Celebrities. A place to discover a whole universe around them throughout specially designed brands in which each product carries the artist's essence. The first eShop for their creations and lifestyle products. As a branch of Star Online Celebrities Brands Limited, which is engaged in the brand development and granting licenses, our main mission is creating and managing value in the long term through important consumer brands. The founders’ experience of more than 20 years in the world of celebrities, and also the success of one of the most important festivals in Europe and Mexico, the Starlite Festival, has enabled us to create a unique platform in which each product is fully identified with the artist.